This article is about the media player. For the upcoming streaming service, see Apple TV+. For other uses, see Apple TV (disambiguation). Its Wi-Fi capability is also used to receive digital content from various iOS apps using AirPlay or directly from the iTunes Store, which is then streamed to the TV. It also plays digital content from the iTunes Store, Netflix, Stan, Foxtel Now, Hulu, Now TV (UK only), SlingTV, PlayStation Vue, Amazon Prime Video, DirecTV, YouTube, Red Bull TV, and Vevo along with HBO Now, Showtime Anytime, Starz, and the TV Everywhere portals of several cable and broadcast networks, and the video subscription portals of all of the four major North American sports leagues: NFL TV app, MLB.tv, NBA League Pass, and NHL.tv. It plays content from any macOS or Windows computer running iTunes. Apple began to promote the Live Tune-In feature that allows the viewer to ask Siri to tune to live streams of CBS, ESPN, and Disney XD among many others that support Live Tune-In. In an early attempt to enter the home entertainment industry, Apple released the Macintosh TV in 1993. Macintosh TV had a 14-inch CRT screen along with a TV tuner card. This did not prove to be a success, as only 10,000 units of Macintosh TV were sold up to its discontinuation in 1994. Apple's next foray into the television industry came with the Apple Interactive Television Box, also in 1994. Apple Interactive Television Box was a collaboration venture between Apple, BT, and Belgacom but it never went on sale to the public. Apple's last major attempt to enter the home entertainment market before Apple TV occurred with their launch of Apple Bandai Pippin based on the Apple Pippin platform in the late 1990s. Apple Bandai Pippin combines a home game console with a networked computer. Starting as early as 2011, Gene Munster, longtime investment banking analyst at Piper Jaffray covering Apple, led and persisted rumors that Apple would announce HDTV television set hardware to directly compete with Sony, LG, Samsung, and other TV makers, but Apple has never released any such product and Munster finally relented and recanted in 2015. This was despite the set being mentioned as a possibility for a future breakthrough product in Steve Jobs' biography Steve Jobs. Apple TV was unveiled as a work in progress called "iTV" on September 12, 2006 using a modified Front Row interface using the Apple Remote. Apple started taking pre-orders for Apple TV on January 9, 2007. The name "iTV" was originally going to be used to keep the product in line with the rest of their "i"-based products (iMac, iPod, etc. ), but was not used because the British terrestrial broadcast network ITV holds the rights to the name in the UK and threatened to take legal action against Apple. Apple TV first shipped on March 21, 2007 with a 40 GB hard disk. A updated model with a 160 GB HDD was released on May 31, 2007; subsequently, Apple ceased selling the 40 GB HDD version on September 14, 2009. On January 15, 2008, a software upgrade was announced; this turned the Apple TV into a stand-alone device which removed the requirement for a computer running iTunes on Mac OS X or Windows to stream or sync content to it, and making most of the Apple TV's hard disk redundant. The update allowed the iTunes Store content to be directly rented and purchased, as well as photo streaming and podcast downloads from MobileMe (which was called .Mac at the time) and Flickr. Front Row became deprecated, and a new interface was introduced for the original Apple TV in which content was organized into six categories, all of which appeared in a large square box on the screen upon startup (movies, TV shows, music, YouTube, podcasts, and photos) and presented in the initial menu, along with a "Settings" option for configuration, including software updates. On July 10, 2008, Apple released the iTunes Remote app on the App Store, and the Apple TV 2.1 software update that added recognition for the iPhone and iPod Touch as remote control devices intended as a software alternative to the Apple Remote. Later updates to the Apple TV, iTunes, and Remote software added support for the iPad, and introduced support for new features as they were added to iTunes. In July 2011, Apple discontinued the Front Row interface for Mac users. On September 9, 2015, Apple discontinued service and support for the first generation Apple TV. Beginning May 25, 2018, iTunes Store is no longer accessible from the device, due to its obsolete security standards. The 2nd generation Apple TV was announced on September 1, 2010, and was the first to run on a variant of iOS. The device is housed in a smaller, all-black case, one-quarter the size of the original. This model replaced the internal hard drive with 8 GB internal flash storage, enough local storage for buffering purposes; all media became streamed, instead of synced. It supports output up to 720p over HDMI only. In May 2015 the YouTube app was removed from 2nd generation Apple TVs due to an API change by Google. On March 7, 2012 Apple announced the 3rd generation Apple TV. It is identical externally to the second generation model, includes a single-core A5 processor, and supports 1080p output. Apple silently released a third generation "Rev A" on January 28, 2013 with component changes included. By October 2016, Apple had phased out the Apple TV third generation, with Apple Store employees instructed to pull all units and demo units from store shelves. Amazon Video was automatically added to 3rd generation Apple TVs running 7.2.2 on December 6, 2017. According to AppleInsider, the TV app and access to Apple TV+ will be added in a forthcoming software update. On September 9, 2015, Apple announced the 4th generation Apple TV at an Apple Special Event. The 4th generation model uses a new operating system, tvOS, with an app store, allowing downloads of third-party apps for video, audio, games and other content. Upon release, third-party apps were available from a limited range of providers, with new APIs providing opportunities for more apps. A requirement of new apps and games was that they must include interfacing with the new touchpad-enabled Siri remote, which was later relaxed for games. In March 2019 Apple rebranded the device as Apple TV HD. The 4th generation includes a 64-bit Apple A8 processor, and adds support for Dolby Digital Plus audio. While similar to the form factor of the 2nd and 3rd generation models, the 4th generation model is taller. In contrast to the old remote's arrow button, the 4th generation Apple TV's touch remote uses swipe-to-select features, Siri support, a built-in microphone, volume control over HDMI CEC and IR, and an accelerometer (IMU). The 4th generation Apple TV started shipping in October 2015. Upon launch, there were several unexpected issues such as incompatibility with Apple's own Remote app for iOS and watchOS. These issues were fixed by Apple on December 8, 2015 in tvOS 9.1. Amazon initially declined to develop an Amazon Video application for Apple TV, and announced in October 2015 it would stop selling Apple TVs, and removed 3rd generation SKUs. In late 2017 Amazon reversed their stance and released an Amazon Video app, and resumed sales of Apple TVs. On September 13, 2016, Apple released the tvOS 10 software update for the Apple TV, bringing an all new remote app, single-sign on, dark mode, HomeKit support, and other features to the 4th generation Apple TV. On September 12, 2017, Apple announced the 5th generation Apple TV, named Apple TV 4K, which supports 2160p output, HDR10, Dolby Vision, and includes a faster Apple A10X Fusion processor supporting HEVC hardware decoding. Dolby Atmos support was added in tvOS 12. Externally it is similar to the 4th generation model, with the only differences being the addition of vents on the base, the removal of the USB-C port, and the addition of a white outline around the menu button on the included Siri Remote. Following the announcement of the new models, the 64 GB version of the 4th generation Apple TV was discontinued. Users of Apple TV can rent or buy movies and TV shows from the iTunes Store, or stream video from a variety of services found in the tvOS App Store such as Netflix, Amazon Prime Video, Hulu, YouTube, Vimeo, HBO Now, Showtime, Sling TV, and DirecTV Now. Users can stream live and on-demand content from apps that support login through a cable provider by way of one universal app called TV. The single-sign on feature in tvOS 10.1 and later allows users to log in to all of these apps at once, bypassing the need to authenticate each individually. Users can access their music and podcasts libraries that they purchased in iTunes through iCloud through the Music and Podcasts apps, respectively. In addition, users can also subscribe to music streaming services such as Apple Music, Pandora Music, Qello, and Vevo and access content that way. The built in Photos app syncs user photos from iCloud Photo Library and displays them on TV. In addition, users can download third-party apps like Adobe Lightroom to view, edit and share them. With the fourth generation Apple TV and later, users can download apps and games from the tvOS App Store. This app store is similar to the one found on the Apple iPhone and iPad. Apps can now be ported from iOS easily by developers since tvOS and iOS share a common codebase and kernel. Examples include the Papa John's Pizza app which allows for users to order pizza right from Apple TV and Zillow which allows users to search for homes right on their TV. A NASA app for Apple TV includes live streaming of NASA TV content, including International Space Station missions. Games use the Accelerometer and Gyroscope along with the touchpad found on the Siri Remote for control. External Bluetooth game controllers can also be paired. Examples include Asphalt 8, which can be played using the Siri Remote. Casting, which allows users to wirelessly send video or audio from their iPhone, iPad, or Mac to the Apple TV. Mirroring, which allows users to wirelessly mirror their Mac screen or AirPlay device which to the TV, using it as a second monitor. Peer-to-Peer AirPlay, which uses Bluetooth to connect if the Apple TV and the iOS Device/Mac are not on the same Wi-Fi network. Siri is built into the fourth generation and later Apple TV. It enables voice dictation in text fields, including usernames and passwords. Universal search is available for a wide number of apps in the United States, but the feature is limited to iTunes and Netflix in Canada, France, Germany, and the United Kingdom. In Australia, universal search supports movies and TV shows in iTunes, Netflix, and Stan. Apple has been expanding the feature to encompass additional channels worldwide. The third generation Apple TV and later can also be used as a home hub to control HomeKit devices, such as locks, thermostats, or garage doors either locally or over the Internet. HomeKit Automation, such as automatic implementation of scenes, multiple user support and using Siri to control devices is possible with a fourth generation Apple TV or later. HDMI CEC to control other devices in a user's home theater setup. App Switcher which enables users to switch apps. Aerial Screensaver which allows the TV to display a flyover view of a city when Apple TV is inactive. Screensavers can also be invoked from the home screen by pressing menu on the Siri Remote once. With the fourth generation Apple TV and tvOS, Apple announced an App Store which allows any developer to make apps using the APIs available specifically tailored towards the TV. Also, since tvOS is based on iOS, any developer can port over apps from iOS and with a few modifications, as Apple stated on stage, and can make them available for all tvOS users with the App Store. The App Store is not available to previous Apple TVs and is a feature of the fourth generation Apple TV onward. Since tvOS and watchOS are based on iOS, they have inherited many of the accessibility features of iOS and macOS and are compatible with Apple's entire product line including the Apple Watch as a remote controller for the Apple TV. tvOS includes the Apple technologies of VoiceOver, Zoom, and Siri to help the blind and those with low vision. Pairing a Bluetooth keyboard with the tvOS on the Apple TV enables another accessibility feature that also is an incorporation of VoiceOver. When typing, VoiceOver mirrors with an audio voice, each character pressed on the keyboard and repeated again when it is entered. The Apple TV is designed to work with the Apple Wireless Keyboard or the Apple Magic Keyboard. Apple TV with and without tvOS supports closed captioning, so the deaf or hard of hearing can properly watch TV episodes and feature-length movies. Compatible episodes and movies are denoted with a CC (closed captioning) or SDH (Descriptive Audio) icon in the iTunes Store either on the Apple TV or in iTunes itself. The viewer can customize the captions in episodes or movies with styles and fonts that are more conducive to their hearing and/or visual impairment. Apple's Remote app on iOS devices allows control of the Apple TV from an iPhone, iPad or iPod Touch. Similar to Google's redesign of YouTube, Apple has restricted access to most viewed charts on movies and podcasts. They are replaced by "Top Movies", "Top Podcasts", and "Editor's Picks". Parental controls allow consumers to limit access to Internet media service content via "Restrictions" settings; individual services can be turned off (e.g., to reduce clutter), icons can be rearranged via the tap-and-hold technique à la iOS. Internet media is split into four categories: "Internet Photos", "YouTube", "Podcasts", and "Purchase and Rental". Each of the categories is configured by a parental control of "Show", "Hide" or "Ask" to prompt for a 4-digit PIN. In addition, movies, TV shows, music and podcasts can be restricted by rating. Apple TV allows users on a computer running iTunes to sync or stream photos, music and videos. A user can connect a computer on a local network to maintain a central home media library of digitized CD, DVD or HD content, provide direct connectivity to photo organization software such as iPhoto, limit home video access to a local network only, play Internet radio, or preload content on Apple TV to be used later as a non-networked video player. For users who wish to connect the Apple TV to a computer, synchronization and streaming modes are supported. Apple TV in synchronization mode works in a way similar to the iPod. It is paired with an iTunes library on a single computer and can synchronize with that library, copying all or selected content to its own storage. Apple TV need not remain connected to the network after syncing. Photos can be synced from iPhoto, Aperture, or from a folder on a Mac, or Adobe Photoshop Album, Photoshop Elements, or from a hard disk folder in Windows. Apple TV can also function as a peer-to-peer digital media player, streaming content from iTunes libraries and playing the content over the network. 1st generation Apple TVs can stream content from up to five computers or iTunes libraries. Also, five Apple TVs can be linked to the same iTunes library. The 2nd generation Apple TV onwards allows users to stream content from more than one iTunes library: these additional iTunes libraries can be on the same or on different computers. This is possible when Apple TV and every iTunes library from which you want to stream content meet all of the following conditions: (1) the Apple TV and the iTunes library you are streaming from are both on the same local network, (2) each uses the iTunes "Home Sharing" feature, and (3) each are using the same "Home Sharing" Apple ID. 4th generation Apple TVs and newer can also stream content locally using third party apps such as Plex and VLC media player. Main/Main 10 profile, hardware decoding on 5th generation, software decoding on 4th generation running tvOS 11 and later. High or Main Profile level 4.0 or lower, or High or Main Profile level 4.2 or lower (4th generation), Baseline profile level 3.0 or lower with AAC-LC audio up to 160 kbits/s per channel, 48 kHz, stereo audio in .m4v, .mp4, and .mov file formats. MPEG-4 video up to 2.5 Mbit/s, 640×480 pixels, 30 frames per second, Simple Profile with AAC-LC audio up to 160 kbit/s, 48 kHz, stereo audio in .m4v, .mp4, and .mov file formats. Motion JPEG (M-JPEG) up to 35 Mbit/s, 1280×720 pixels, 30 fps, audio in ulaw, PCM stereo audio in .avi file format. Compatible with high-definition TVs with HDMI and capable of 1080p or 720p at 60/50 Hz. Requires HDCP when playing copy-protected content. A sustained 8 Mbit/s or faster Internet connection is recommended for viewing 1080p HD movies and TV shows, 6 Mbit/s or faster for viewing 720p content, and 2.5 Mbit/s or faster for SD content. Attempts to sync unsupported content to Apple TV will draw an error message from iTunes. The 1st and 2nd generation Apple TV video output can be set to either 1080i or 1080p; however, this resolution is limited to the user interface and the viewing of photographs – all other content is simply upscaled to those resolutions. Those models cannot play 1080i or 1080p video content (e.g., HD camera video). The 3rd and 4th generation Apple TV support 1080p video content. The Apple TV 4K, as the name suggests, supports 4K resolutions and HDR, including Dolby Vision. 4K content from sources such as iTunes can be played on a compatible 4K television set. Apple offers H.264 1080p movies and video podcasts on iTunes. In comparison, Blu-ray Disc films are 1080p H.264 or VC-1 video encoded at rates of up to 40 Mbit/s. Apple TV's audio chip supports 7.1 surround sound, and some high definition rentals from iTunes are offered with Dolby Digital 5.1 surround sound. There is an Apple TV export option in QuickTime which allows content in some formats that the device does not support to be easily re-encoded. Applications that use QuickTime to export media can use this; e.g., iMovie's Share menu, iTunes' advanced menu, and some third-party content conversion tools. Apple TV streams video through an HDMI cable (Type A) connected to the TV's HDMI port. Audio is supported through the optical or HDMI ports. The device also has a Micro-USB port, which is reserved for service and diagnostics. The device connects through Ethernet or Wi-Fi to the computer for digital content from the Internet and local networks. Apple TV does not come with audio, video or other cables, which must be acquired additionally as required. On the previous Apple TV, media files could be transferred directly onto the device by syncing with another computer. Once content was stored on the device's hard drive, Internet connectivity was no longer needed to view content. This is not the case with the later models, which do not have a hard drive for storing media. The 1st generation Apple TV had component video and RCA connector audio ports, both removed in the 2nd generation. The device does not have RCA/composite video or F/RF connectors. Starting with the 4th generation Apple TV, Apple removed the optical audio port. Apple also enhanced the HDMI port by adding support for HDMI 1.4. The 4th generation also removed the Micro-USB port in favor of the reversible USB-C port and the 5th generation removed USB entirely. AirPlay allows iOS devices or an AirPort-enabled computer with the iTunes music player to send a stream of music to multiple (three to six, in typical conditions) stereos connected to an AirPort Express (the audio-only antecedent of Apple TV) or Apple TV. Speakers attached to an AirPort Express or Apple TV can be selected from within the "Remote" iPhone/iPod Touch program, allowing full AirPlay compatibility (see "Remote control" section below). A compatible Mac running OS X Mountain Lion or later can wirelessly mirror its screen to an Apple TV through AirPlay Mirroring while one running OS X Mavericks or later can also extend its display with AirPlay Display. Apple TV can be controlled by many infrared remote controls or paired with the included Apple Remote to prevent interference from other remotes. Either kind of remote can control playback volume, but for music only. The Apple Wireless Keyboard is supported on the 2nd generation Apple TV and later using the built-in Bluetooth. The consumer has the ability to control media playback, navigate menus and input text and other information. Third-party keyboards that use the Apple layout may also be compatible. On July 10, 2008, Apple released Remote, a free iOS application that allows the iPhone, iPod Touch, and iPad to control the iTunes library on the Apple TV via Wi-Fi. The Apple Watch also has a remote app to control Apple TV. The Remote App was updated on September 13, 2016, to take advantage of all the features of the Apple TV 4. This includes Siri, Touchpad, and Home Buttons, along with a now playing screen. The Apple Siri Remote is included with the fourth generation Apple TV and later, as well as being sold by itself. On September 9, 2015, Apple announced the new Siri Remote for the 4th generation Apple TV (although in some territories, Apple have kept the name Apple TV Remote, due to Siri functionality not being enabled on it in that territory). It is a completely redesigned remote that features dual microphones for Siri support and a glass touch surface for navigation around the interface by swiping or tapping and scrubbing to fast forward or rewind. Also, it has a menu and home button, a Siri button to invoke Siri, a Play/Pause button, and a Volume Up/Down button to control the volume on the TV. The Siri Remote communicates with the Apple TV via Bluetooth rather than infrared, removing the requirement of a line-of-sight with the device. This new remote is only supported by the 4th generation Apple TV and later and will not work with earlier generations. Beginning with the 4th generation Apple TV, the remote includes two microphones and a button to activate Siri. Siri on the Apple TV has all of the functions of Siri on iOS 9; it can also respond to requests specifically for the TV. For instance, the viewer can ask Siri to search for a TV show or movie and it will search across multiple different sources to tell the user where the content is available to watch. It can also do things such as Play/Pause, Rewind/Fast Forward, skip back 15 seconds and temporarily turn on captioning when asked "what did he say?" or "what did she say? ", open a specific app, and more. Apple TV software 1.0 presented the user with an interface similar to that of Front Row. Like Front Row on the Mac, it presents the user with seven options for consuming content. Movies, TV Shows, Music, Podcasts, Photos, Settings, and Sources. It was a modified version of OS x v10.4 Tiger. In February 2008, Apple released a major and free upgrade to the Apple TV, labelled "Take Two"(2.0). This update did away with Front Row and introduced a new interface in which content was organized into six categories, all of which appeared in a large square box on the screen upon startup (movies, TV shows, music, YouTube, podcasts, and photos) and presented in the initial menu, along with a "Settings" option for configuration, including software updates. In October 2009, Apple released a minor upgrade for the Apple TV called "Apple TV Software 3.0". This update replaced the interface in version 2.0 with a new interface which presented seven horizontal columns across the top of the screen for the different categories of content (Movies, TV Shows, Music, Podcasts, Photos, Internet, and Settings). This update also added features such as content filtering, iTunes Extras, new fonts, and a new Internet radio app. The user interface used in the third generation Apple TV series featured a rounded rectangle tile interface. The 2nd and 3rd generation Apple TVs run a version of iOS, rather than the modified Mac OS X of the original model. The interface on Apple TV Software 4 is similar to that of previous versions, with only minor changes and feature additions throughout. In March 2012, Apple released a major new software update, with the Apple TV 3rd generation, labeled as Apple TV Software 5 (iOS 5.1), which shipped with the new 3rd generation Apple TV. This update completely revised the look of the home screen to make it resemble the icon grid seen on iOS. Instead of 7 columns, content and third-party channels are shown in a tiled grid format, which can be rearranged. Throughout the years, for Apple TV Software 5-6, Apple released minor revisions, content additions, and feature updates. The Apple TV Software 7.0 features a flat look similar to iOS 7 and OS X Yosemite and adds features such as Peer-To-Peer AirPlay. Version 8.0 was skipped. Apple TV Software 7.2.2 (iOS 8.4.2) is currently available for the Apple TV (3rd generation), as of March 2019. It does not support tvOS 9.0 or later. However, it does support Amazon Video, which was automatically added to those Apple TVs running 7.2.2 on December 6, 2017. On March 27, 2019, Apple TV Software 7.3 (Beta 1) was released to developers, alongside tvOS 12.3. This is the first update to the third-generation Apple TV since 2016. The new update brings compatibility with the forthcoming Apple TV+ service. The fourth generation Apple TV and later run an operating system called tvOS which does not support the earlier generations of Apple TV. It features an app store, allowing third-party app developers to release their own apps on the platform. The new software also features support for Siri voice control. The tvOS software development kit (SDK) for developing tvOS apps is included in Xcode 7.1 and later. A new development feature, App Thinning, is used in the Apple TV, running on tvOS, due to the storage restrictions of the device (32 GB and 64 GB) and the dual-use of the NAND Flash Memory to precache movies from Apple's content servers as well as storage for downloaded applications from the tvOS App Store. Apple's aim is to limit the size of application downloads and steering users toward downloading individual segments of apps in order to better manage storage space. Developers have reacted with criticism toward the download size limits, arguing that it leads to situations where game data is purged and has to be re-downloaded. Apple TV contains neither a TV tuner nor a personal video recorder. Both capabilities can be applied to the connected home computer through various third-party products, such as allowing PVR software to connect to iTunes and enable scheduled HDTV recordings to play automatically via Apple TV for playback. The Front Row interface lacks some iTunes functionality, including rating items, checking the account balance, adding funds to the account, synchronizing from more than one computer, full Internet radio support, and games. The Movies search box only searches the iTunes Store, not local hard drives and networks. Movies rented on Apple TV must be watched on Apple TV, unlike iTunes rentals, which can be transferred to any video-enabled iPod, iPhone, or Apple TV. Movies purchased on Apple TV can be moved to a video-enabled iPod or iPhone via iTunes. Apple TV prior to 4th generation does not support the HDMI Consumer Electronics Control (HDMI CEC) protocol. On the Apple TV (2nd generation), digital output audio is up-sampled to 48 kHz, including lossless CD rips at 44.1 kHz. Although this is a higher frequency and the difference is not audible in most cases, it falls short of digital transmission of data standards due to the audio not being 'bit perfect'. Within the first week of presales in January 2007, Apple TV was the top pre-selling item at the Apple Store. Orders exceeded 100,000 units by the end of January and Apple began ramping-up to sell over a million units before the 2007 holiday season. Analysts began calling it a "DVD killer" that could enable multiple services. Analysts also predicted that Apple could sell up to 1.5 million units in the first year. Besides the Apple Store, Best Buy was one of the first retailers to carry the device; Target and Costco followed shortly thereafter. Two months into sales, Forrester Research predicted at the time that Apple would only sell a million Apple TV units, because consumers prefer advertisement-supported content over paid content. Forrester predicted that cable companies would be the clear winners over content providers such as the iTunes Store. Shortly after, Apple released YouTube functionality and Jobs stated that Apple TV was a "DVD player for the Internet". Some market analysts predicted that YouTube on Apple TV "provides a glimpse of this product's potential and its future evolution", but overall, analysts had mixed reactions regarding the future of Apple TV. Some negative reactions followed after Jobs referred to the device as a "hobby", implying it was less significant than the Macintosh, iPod, and iPhone. In the fourth quarter of 2008, sales were triple that of the fourth quarter of 2007. In Apple's first-quarter 2009 financial results conference call, acting chief executive Tim Cook stated that Apple TV sales increased three times over the same quarter a year ago. Cook mentioned that the movie rental business was working well for Apple, Apple would continue investment in movie rentals and Apple TV, but Apple TV is still considered a hobby for the company. 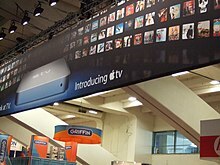 Due to the growth of digital TV and consumers turning to Internet media services, an analyst at the time predicted sales of 6.6 million Apple TVs by the end of 2009. The second generation sold 250,000 units in the first two weeks it was available. On December 21, 2010, Apple announced that they had sold 1 million units. In the second fiscal quarter of 2011, it had topped 2 million in total sales, with 820,000 sold in that quarter alone. On January 24, 2012, Apple announced they had sold 1.4 million units in the first fiscal quarter of 2012, and 2.8 million units in all of fiscal year 2011. (4.2 million units through January 1, 2012). Tim Cook announced at the All Things Digital conference in May 2012 that Apple had sold 2.7 million of the 3rd generation model in 2012. In the Q4 FY2012 earnings call, Engadget reported comments from Tim Cook that Apple had shipped 1.3 million Apple TV units in the 4th Quarter (presumed to be 3rd generation). MacObserver reported statements by Tim Cook in the Q1 FY2013 earnings call that Apple sold over 2 million Apple TV units in the December Quarter (presumed to be 3rd generation). These reports lead to a cumulative volume of the 3rd generation device of 6 million units, as of January 1, 2013. On February 28, 2014, at Apple's shareholders meeting, Apple CEO Tim Cook announced that in 2013 Apple TV brought in 1 billion dollars of revenue for Apple. A market survey published by Parks Associates in December 2014 found that Apple TV has lost consumer traction to Google Chromecast, garnering only a 17% market share. Tim Cook announced at the Apple Watch conference on March 9, 2015, that Apple had sold a total of 25 million Apple TVs up to that point. In the January 27, 2016, Apple earnings call, CEO Tim Cook stated that the Apple TV had record sales. However, no specific sales figures were mentioned; Apple TV is included in an "Other products" category, which also includes the Apple Watch, iPods, and Beats products, and is not broken down by individual products. ^ "Apple TV". Apple Store. Archived from the original on January 14, 2007. ^ "Differences Between Apple TV 2 and Apple TV 3: EveryMac.com". EveryMac.com. Retrieved August 18, 2018. ^ "Apple TV - Tech Specs - Apple". Apple. Retrieved November 4, 2015. ^ "Apple Releases tvOS 12.2 for Fourth and Fifth-Generation Apple TV". MacRumors. Retrieved March 26, 2019. ^ "Apple unveils new TV app for Apple TV, iPhone and iPad". Apple Inc. October 27, 2016. ^ a b "Apple TVs (plus iPods & Cinema Displays) hitting obsolete status day before new hardware on Sept 9". 9to5Mac. ^ "Apple TV: Can I program my universal remote to work with Apple TV". Apple Inc. Retrieved August 24, 2018. ^ "Can the Apple TV bring everything under (remote) control?". Macworld. Retrieved August 24, 2018. ^ Greenwald, Will (March 26, 2019). "Apple TV Is the Death of Apple TV". PCMag.com. Retrieved March 26, 2019. ^ Munson, Ben (March 26, 2019). "Apple TV will die so TV+ can live". FierceVideo. Retrieved March 26, 2019. ^ Lawrence, Dallas (March 26, 2019). "Apple TV's biggest news isn't about content, it's about screens — you can watch anywhere". VentureBeat. Retrieved March 26, 2019. ^ Hiner, Jason (March 25, 2019). "3 ways the new Apple TV services will make cord cutting better". Cnet.com. Retrieved March 26, 2019. ^ Pullen, John Patrick (March 24, 2019). "Apple's Two-Word Plan for the Future of the Internet: Subscribe Now". Forbes.com. Retrieved March 25, 2019. ^ Lee, Wendy; Faughnder, Ryan (March 25, 2019). "Apple unveils ambitious new video service intended to take on Netflix". Los Angeles Times. Retrieved March 25, 2019. ^ Baig, Edward C. (March 25, 2019). "Apple goes big on premium services: Apple TV+ streaming, News+, Arcade and new credit card". USA Today. Retrieved March 25, 2019. ^ Hardawar, Devindra (March 25, 2019). "Apple TV Channels is an a la carte way to watch your favorite networks". Engadget. Retrieved March 25, 2019. ^ Holloway, Daniel (March 25, 2019). "Apple Reveals New TV Streaming Service". Variety.com. Retrieved March 26, 2019. ^ "When Apple flops: The worst Apple products of all time". Network World. Retrieved August 12, 2018. ^ a b c d "Apple TV: The history of Apple's bid to take over your living room". The Daily Telegraph. Retrieved August 12, 2018. ^ "Apple TV Prototype Sells on eBay for 46 Bucks". Wired. Retrieved August 12, 2018. ^ "When Apple Failed". Forbes. Forbes. Retrieved August 12, 2018. ^ a b "Is Apple planning a DVR and web-enabled TV set?". TechRadar.com. March 2, 2009. Archived from the original on March 6, 2009. Retrieved March 18, 2009. ^ Steve Jobs (2011, Simon & Schuster, ISBN 978-1451648539). ^ Cohen, Peter (September 12, 2006). "Apple 'It's Showtime!' event". MacWorld. Retrieved September 13, 2006. ^ Eran, Daniel (September 13, 2006). "How Apple's iTV Media Strategy Works". RoughlyDrafted Magazine. Retrieved June 19, 2009. ^ "ITV warns Apple not to brand smart television 'iTV'". Retrieved February 22, 2015. ^ a b "Apple TV Now Shipping" (Press release). March 21, 2007. Retrieved June 18, 2017. ^ Arya, Aayush (September 14, 2009). "Apple drops price of 160GB Apple TV, kills 40GB model". MacWorld. Archived from the original on October 5, 2009. Retrieved September 14, 2009. ^ a b "Apple TV: About Apple TV software updates". Apple Inc. November 19, 2008. Archived from the original on December 5, 2008. Retrieved November 20, 2008. ^ a b "Gallery: Apple TV Take 2 software update". MacNN. February 12, 2008. Retrieved March 12, 2009. ^ a b "How to update Apple TV software". Apple. September 2, 2008. Retrieved March 12, 2009. ^ Ricker, Thomas (July 10, 2008). "Apple's Remote: turns your iPhone into a WiFi remote control". Engadget. AOL. Retrieved July 14, 2008. ^ Bohon, Cory (July 10, 2008). "Apple TV 2.1 update goes live, adds MobileMe support". The Unofficial Apple Weblog. AOL. Retrieved July 14, 2008. ^ Breen, Christopher (July 22, 2011). "Farewell Front Row". Macworld. International Data Group. Retrieved September 19, 2018. ^ "About iTunes Store availability". February 23, 2018. ^ "Overhauled Apple TV unveiled". The Spy Report. Media Spy. September 2, 2010. Archived from the original on March 13, 2012. Retrieved September 8, 2010. ^ Helft, Miguel (September 1, 2010). "From Apple, a Step Into Social Media for Music". The New York Times. Archived from the original on September 2, 2010. Retrieved September 8, 2010. ^ Heussner, Ki Mae (September 1, 2010). "Apple Goes 'Wild' Over New iPods". ABC News. Archived from the original on September 4, 2010. Retrieved September 8, 2010. ^ "Apple TV 2nd Generation Teardown — Page 2". iFixit. Retrieved March 28, 2012. ^ Apple pulls YouTube from older 2nd-gen Apple TVs after planned Google API change. 9to5Mac. May 4, 2015. ^ "Apple". Archived from the original on August 9, 2013. ^ "Apple discontinues third-gen Apple TV, removes it from online store". ^ a b "Amazon Prime Video app rolling out to Apple TV App Store". 9to5Mac. December 6, 2017. Retrieved December 6, 2017. ^ The new TV App is coming to third generation Apple TV hardware. AppleInsider. March 27, 2019. ^ "Apple TV game developers are required to support the Siri remote". Engadget. Retrieved September 16, 2015. ^ Apple TV games are no longer required to support Siri Remote. iDOwnloadBlog. June 14, 2016. ^ Apple rebrands 2015 Apple TV as ‘Apple TV HD’ as it introduces Apple TV+ streaming service. 9to5Mac. March 25, 2019. ^ Campbell, Mikey (October 30, 2015). "New Apple TV incompatible with Apple's own Remote app for iOS and watchOS". Retrieved January 12, 2016. ^ "Apple Remote App for iOS Now Works With New Apple TV Following tvOS 9.1 Update". Retrieved October 15, 2018. ^ Horwitz, Jeremy (October 30, 2015). "Amazon follows through on threat, yanking all Apple TV hardware from leading online retail store". 9to5Mac. Retrieved January 12, 2016. ^ Broussard, Mitchel (June 5, 2017). "Apple Confirms Amazon Prime Video Coming to Apple TV Later This Year". MacRumors. Retrieved September 23, 2018. ^ "Amazon making nice, prepares sales of Apple TV, Chromecast". Associated Press. December 15, 2017. Retrieved December 19, 2017. ^ The Apple TV is finally getting Dolby Atmos support. The Verge. ^ "tvOS 12 now available for Apple TV 4 and Apple TV 4K, brings Dolby Atmos audio, screensaver updates, more". 9to5Mac. September 17, 2018. Retrieved September 18, 2018. ^ Apple TV 4K brings home the magic of cinema with 4K and HDR. Apple. September 12, 2017. ^ "Apple discontinues third-gen Apple TV, removes it from online store". 9to5Mac. Retrieved October 8, 2016. ^ "Announcing Lightroom for Apple TV". blogs.adobe.com. Retrieved October 8, 2016. ^ "How to sync Apple iPhone photos to iPad, Mac, Apple TV". CNBC. Retrieved August 12, 2018. ^ "Papa John's now lets you order pizza straight from your Apple TV". 9to5Mac. Retrieved October 8, 2016. ^ "Apple TV Can Help You Find a New Home". Lifewire. Retrieved August 13, 2018. ^ "NASA app for Apple TV adds live streaming from ISS, on-demand video, 15k photos & more". 9to5Mac. Retrieved August 13, 2018. ^ "How to AirPlay content from your iPhone, iPad, or iPod touch". support.apple.com. Retrieved October 8, 2016. ^ "How to find something you'll like on Netflix, Stan and Presto". Business Insider Australia. Retrieved August 13, 2018. ^ "About Search on your Apple TV (4th generation) - Apple Support". support.apple.com. Retrieved August 13, 2016. ^ Clover, Juli. "Apple TV Universal Search Gains Support for 9 New Channels Including Food Network and HGTV". MacRumors. Retrieved August 13, 2016. ^ "Automate and remotely access your HomeKit accessories". Apple Support. Retrieved January 19, 2018. ^ "Control your TV or receiver with your Siri Remote or Apple TV Remote - Apple Support". support.apple.com. Retrieved August 13, 2016. ^ "Aerial Screensavers on the new Apple TV". iLounge.com. Retrieved August 13, 2016. ^ Mayo, Benjamin (October 3, 2015). "Tim Cook: Apple will offer an Apple TV API to open up universal search beyond initial launch partners". 9to5Mac. Retrieved September 26, 2018. ^ "Accessibility on tvOS". Apple Inc. Retrieved September 26, 2018. ^ "Turn on closed captions and subtitles on your Apple TV". Apple Inc. Retrieved September 26, 2018. ^ Elliott, Matt (March 2, 2017). "What to do if you lose your Apple TV remote". CNET. CBS Interactive. Retrieved September 26, 2018. ^ "What's wrong with Apple TV". MacWorld. Retrieved August 13, 2018. ^ Lynch, Jim (February 15, 2008). "Hands On with Apple TV 2.0". ExtremeTech. Retrieved February 19, 2016. ^ a b "Apple TV Fast Start: The New User's Guide for Apple TV". Apple. November 26, 2008. Archived from the original on December 28, 2008. Retrieved June 18, 2009. ^ "My Apple TV Take Two Review: Ripping DVDs, Creating a Media Library, and HD Downloads". Myhdtvchoice.com. March 1, 2008. Archived from the original on February 23, 2009. Retrieved March 13, 2009. ^ "My Take on Apple TV, Take Two". Tunegardener.com. February 17, 2008. Retrieved March 13, 2009. ^ "Liberate Your Memories: Home Movies on Your Apple TV". theAppleBlog. October 8, 2008. Archived from the original on February 25, 2009. Retrieved March 13, 2009. ^ Breen, Christopher (September 4, 2008). "Adding streaming radio to Apple TV". MacWorld. Retrieved March 13, 2009. ^ Lu, Mat (April 30, 2008). "Apple TV offers limited internet radio support". The Unofficial Apple Weblog. Retrieved March 14, 2009. ^ a b c Pegoraro, Rob (March 29, 2007). "Apple Tries to Bridge Computer Desk, Living Room". The Washington Post. Retrieved June 18, 2009. ^ "iTunes for Windows 8.0 Help: Syncing your Apple TV with iTunes". Apple. Archived from the original on March 2, 2014. Retrieved April 14, 2007. ^ "Apple TV: Syncing Photos via iTunes". Apple. Archived from the original on February 26, 2009. Retrieved March 15, 2009. ^ a b c d Cheng, Jacqui; Ecker, Clint (March 27, 2007). "Apple TV: an in-depth review". ArsTechnica. Retrieved April 2, 2007. ^ a b c d Falcone, John P. (March 27, 2007). "Review: Apple TV best for iTunes addicts". CNN. Archived from the original on April 10, 2007. Retrieved April 3, 2007. ^ Apple has chosen HEVC as its next-generation video codec. 8 June 2017. ^ "Apple TV Technical Specifications". Apple. Archived from the original on January 13, 2007. Retrieved November 1, 2015. ^ "Apple TV Technical Specifications". Apple. Archived from the original on November 29, 2010. Retrieved November 1, 2015. ^ "Apple TV Technical Specifications". Apple. Archived from the original on August 30, 2013. Retrieved November 1, 2015. ^ a b c "Apple TV Technical Specifications". Apple. Retrieved November 1, 2015. ^ "Apple TV: Tip – Author your own movie content with AC-3 audio for true surround sound". Apple Inc. Archived from the original on April 4, 2010. Retrieved April 7, 2011. ^ a b Kafasis, Paul (March 22, 2007). "AppleTV Surprises And Impressions". Software's Under the Microscope. Rogue Amoeba. Archived from the original on March 27, 2007. Retrieved April 3, 2007. ^ Breen, Christopher (March 30, 2007). "Apple TV". MacWorld. Archived from the original on April 29, 2007. Retrieved April 22, 2007. ^ Sadun, Erica (April 5, 2007). "AP disses Apple TV". The Unofficial Apple Weblog. Archived from the original on April 20, 2007. Retrieved April 10, 2007. ^ Reynolds, Paul (March 21, 2007). "Apple TV: Is it a "must-see" show". Consumer Reports. Archived from the original on October 13, 2007. Retrieved April 22, 2007. ^ "apple.com - Apple TV". Apple. January 15, 2013. Retrieved January 15, 2013. ^ Ou, George (January 18, 2008). "Here's what fake HD video looks like". ZDNet. Retrieved February 19, 2016. ^ Frakes, Dan (March 28, 2007). "Hacking Apple TV". MacWorld. Archived from the original on April 27, 2007. Retrieved April 23, 2007. ^ "Apple TV – HD Movie Rentals". Apple. Archived from the original on February 4, 2008. Retrieved January 29, 2008. ^ Horwitz, Jeremy (March 18, 2007). "QuickTime gains 720P Apple TV high-definition export mode". iLounge.com. Archived from the original on March 29, 2007. Retrieved April 3, 2007. ^ "iMovie 8.0 Help: Watching your movies on Apple TV". Apple. Archived from the original on June 13, 2011. Retrieved March 12, 2009. ^ Breen, Christopher (February 5, 2009). "DVD ripping FAQ". MacWorld. Archived from the original on March 11, 2009. Retrieved March 12, 2009. ^ Macworld has a guide for using the tools to convert media to Apple TV-compatible formats: Seff, Jonathan (April 4, 2007). "Convert video for Apple TV". MacWorld. Archived from the original on April 16, 2007. Retrieved April 20, 2007. ^ "Apple TV technical specifications". Retrieved June 4, 2014. ^ "Apple TV – Tech Specs". Apple. Archived from the original on April 7, 2007. Retrieved April 3, 2007. ^ "Apple TV: Using AirPlay". Apple. November 20, 2008. Retrieved March 12, 2009. ^ "Apple WDS Setup". Support.apple.com. February 11, 2011. Retrieved March 28, 2012. ^ "iTunes Remote". Apple. September 13, 2011. Archived from the original on March 29, 2012. Retrieved March 28, 2012. ^ "Mountain Lion Review: OS X Needs a New Vision". Gizmodo. Retrieved August 13, 2018. ^ "OS X Mountain Lion - Inspired by iPad. Made for the Mac". Apple. Apple Inc. Retrieved February 22, 2012. ^ "About Remote Learning on Apple TV". Apple. November 20, 2008. Archived from the original on April 6, 2009. Retrieved March 11, 2009. ^ "Pairing and Unpairing the Apple Remote with Apple TV". Apple. Retrieved April 21, 2007. ^ Breen, Christopher (May 31, 2006). "My multimedia Mac mini". MacWorld. Retrieved April 21, 2007. ^ Carlson, Jeff (November 21, 2008). "Apple TV 2.3 Adds AirTunes, Volume Control". TidBITS. Retrieved November 21, 2009. ^ McNulty, Scott (November 24, 2008). "Apple TV 2.3: Now With More Remotes, and Remote Music". PC World. Retrieved March 12, 2009. ^ a b c "Apple TV: Using the Apple Wireless Keyboard". Apple. April 26, 2013. Retrieved September 14, 2013. ^ The Apple Remote Application can also be used to control your PC's iTunes library, Wi-Fi connected speaker system and more. Ricker, Thomas (July 10, 2008). "Apple's Remote: turns your iPhone into a WiFi remote control". Engadget. Archived from the original on July 14, 2008. Retrieved July 14, 2008. ^ Bohon, Cory (July 10, 2008). "Apple TV 2.1 update goes live, adds MobileMe support". The Unofficial Apple Weblog. Archived from the original on July 14, 2008. Retrieved July 14, 2008. ^ "Control Apple TV". Help.apple.com. Retrieved July 10, 2015. ^ "Everything new in tvOS 10: Smarter Siri, dark mode, HomeKit, more". 9to5mac. Retrieved August 13, 2018. ^ "Apple TV -Tech Specs - Apple (HK)". Apple. Retrieved November 4, 2015. ^ "9 Siri commands to use with your Apple TV remote". CNET. CNET. Retrieved August 12, 2018. ^ "Everything You Can Say to Siri on the New Apple TV". Gizmodo. Retrieved August 12, 2018. ^ "What operating system do the Apple TV models use? Do they run Mac OS X? Do they run iOS?". EveryMac. April 12, 2013. Retrieved September 16, 2013. ^ "From hobby to hero: The history of Apple TV". Cult of Mac. Cult of Mac. Retrieved August 12, 2018. ^ "Picking the Ultimate Home Entertainment Box: Apple TV 3.0, why it's triple the meh". PC Authority Australia. PC Authority Australia. Retrieved August 12, 2018. ^ "Hands On with Apple TV 3.0". PC Mag. Retrieved August 12, 2018. ^ "Apple Introduces Apple TV 3.0 Software With Redesigned User Interface". Apple Newsroom. Apple. Retrieved January 3, 2019. ^ "12 Things You Need To Know About Apple TV 3.0". Gizmodo. Retrieved August 12, 2018. ^ "Is it the end of the line for the second-generation Apple TV?". iMore. Retrieved January 3, 2019. ^ "Apple TV (3rd Generation, Early 2013) Specs (3rd Gen, MD199LL/A". Every Mac. Retrieved January 3, 2019. ^ "Apple cutting off payment source changes for older versions of iOS". AppleInsider. Retrieved January 3, 2019. ^ "Apple TV 1080P Review (2012)". Gotta Be Mobile. Retrieved January 3, 2019. ^ "2013 Apple TV revision gets its first exclusive feature: iOS 8's Peer-to". 9to5mac. Retrieved August 12, 2018. ^ Hall, Zac (March 27, 2019). "tvOS 12.3 beta now available for Apple TV HD and 4K, Apple TV 3 picks up new 7.3 software beta". 9to5Mac. Retrieved April 8, 2019. ^ "These are the most popular apps on Apple's new App Store". Fortune. Retrieved August 13, 2018. ^ Cunningham, Andrew (September 9, 2015). "Apple unveils 64GB Apple TV for $199, 32GB model for $149". Ars Technica. San Francisco, California. Archived from the original on September 9, 2015. Retrieved September 9, 2015. ^ "tvOS for Developers". Apple Inc. Retrieved September 10, 2015. ^ a b "Apple TV is a Radical Rethinking of Your Relationship with the Hardware and Games You Own". Polygon. Retrieved August 13, 2018. ^ "TV (3rd Generation, Early 2012) Specs". EveryMac.com. Retrieved September 16, 2013. ^ "What's inside an Apple TV: Tear-down reveals (almost) all". AppleInsider. March 28, 2007. Archived from the original on August 19, 2007. Retrieved August 1, 2007. ^ "Pentium M-based Intel chip at heart of Apple TV". AppleInsider. January 15, 2007. ^ Shimpi, Anand Lal (March 22, 2007). "Apple TV". AnandTech. Retrieved March 23, 2007. ^ "New Apple TV Offers 8 GB of Internal Storage, 256 MB RAM". MacRumors. September 29, 2010. ^ a b "ATV3 Teardown". XBMC Forums. ^ "New Apple TV has 2 GB RAM, included 802.11ac WiFi is faster than its Ethernet port". 9to5Mac. September 9, 2015. ^ "App Programming Guide for tvOS". Apple. September 10, 2015. Retrieved September 16, 2015. ^ a b "Apple TV 4K Teardown". iFixit. September 25, 2017. Retrieved September 26, 2017. ^ "Apple TV 2nd Generation Teardown". iFixIt. September 29, 2010. ^ Cheng, Jacqui (January 9, 2007). "ARS at Macworld: Questions about the Apple TV". Ars Technica. Archived from the original on March 8, 2007. Retrieved March 23, 2007. ^ "Apple TV (1st generation) – Technical Specifications". Apple. September 29, 2010. Archived from the original on September 14, 2010. Retrieved October 1, 2010. ^ "Apple TV 4th Generation Teardown". iFixit. ^ "New Apple TV (Model A1469) Discovered In FCC Filings, Likely To Arrive With Updated A5X (SoC) Processor". Archived from the original on June 5, 2013. Retrieved April 5, 2013. ^ "tvOS SDK Release Notes for tvOS 9.0 Beta". Apple Inc.
^ "App Programming Guide for tvOS: The New Apple TV". Apple Inc. The new Apple TV uses the latest iOS frameworks and frameworks that are unique to tvOS. ^ "Software updates for Apple TV (3rd generation)". Apple Inc.
^ Sadun, Erica (April 18, 2007). "Elgato releases EyeTV 2.4 update". The Unofficial Apple Weblog. Retrieved April 20, 2007. ^ Chartier, David (March 29, 2007). "Apple TV: What you can't do". The Unofficial Apple Weblog. Archived from the original on May 2, 2007. Retrieved April 4, 2007. ^ Dilger, Daniel Eran (February 5, 2009). "How Apple TV can score at the big 3.0". RoughlyDrafted Magazine. Archived from the original on February 9, 2009. Retrieved March 17, 2009. ^ Berka, Justin (March 7, 2007). "Apple TV might have games, eventually". Ars Technica. Retrieved July 21, 2007. ^ Horwitz, Jeremy (January 30, 2008). "What to Expect From Apple TV 2.0: Photos and Details". iLounge. Retrieved July 8, 2009. ^ "How to rent a movie from the iTunes Store on Apple TV". Apple. December 1, 2008. Archived from the original on February 27, 2009. Retrieved March 12, 2009. ^ "iTunes Store movie rental usage rights in the United States". Apple. December 17, 2008. Retrieved March 17, 2009. ^ Block, Ryan (January 16, 2008). "iTunes and Apple TV rentals and purchases: what you can (and can't) do". Engadget. Archived from the original on May 24, 2008. Retrieved March 17, 2009. ^ "All about the numbers..." AVHub.com.au. February 23, 2011. ^ "Apple TV tops best seller list at Apple Store". AppleInsider. January 17, 2007. Archived from the original on June 29, 2007. Retrieved July 18, 2007. ^ staff (January 24, 2007). "Apple TV Blowing Away Expectations". Apple Recon. Retrieved September 3, 2007. ^ Martin, Scott (February 20, 2007). "Apple TV: DVD Killer?". redherring.com. Archived from the original on February 2, 2010. Retrieved July 18, 2007. ^ Christ, Steve (March 22, 2007). "Apple's Next Evolution". Wealth Daily. Retrieved March 18, 2009. ^ Ogg, Erica (March 21, 2007). "Best Buy finagles Apple TV exclusive". CNET. Retrieved July 18, 2007. ^ Cheng, Jacqui (April 30, 2007). "Apple TV shows up at Target and...Costco?". Ars Technica. Archived from the original on June 4, 2009. Retrieved June 18, 2009. ^ Plesser, Andy (May 24, 2007). "Apple TV Sales Will Stall at 1 Million". AlwaysOn. Archived from the original on October 13, 2007. Retrieved July 18, 2007. ^ Crum, Rex (May 31, 2007). "Apple boosts analysts' hopes for Apple TV". MarketWatch. CBS. Archived from the original on July 3, 2007. Retrieved July 18, 2007. ^ Block, Ryan (May 30, 2007). "Steve Jobs live from D 2007". Engadget. Retrieved June 18, 2009. ^ a b McLean, Prince (January 21, 2009). "Apple TV sales up threefold, will see continued investment". "RoughlyDrafted Magazine". Archived from the original on February 1, 2009. Retrieved March 14, 2009. ^ Apple Stock Watch. "Apple TV Sales Hit 250,000 in Q4". MacObserver. Retrieved March 28, 2012. ^ Total shipments of new Apple TV top 2 million, 820K sold last quarter – report. April 19, 2011. Apple TV Second Generation holds 32 Percent of Internet Connected TV Markets, AppleInsider. ^ "Apple Q1 2012: le trimestre de tous les records" (in French). Maximejohnson.com. Retrieved March 28, 2012. ^ "Apple's CEO Discusses Q1 2012 Results - Earnings Call Transcript". Seeking Alpha. Retrieved April 5, 2013. ^ "Apple TV has Sold 2.7 Million Units This Year, Says Tim Cook". Retrieved April 5, 2013. ^ "Apple Q4 2012 earnings: $36 billion in revenue, $8.2 billion net profit". Engadget. Retrieved April 5, 2013. ^ "Apple Earnings Report Q1 - 2013 on January 23rd, 2013". Retrieved April 5, 2013. ^ "Apple CEO promises new products, says Apple TV no longer a 'hobby'". Reuters UK. ^ "Apple TV fades away in streaming video player market". Rapid TV News. December 3, 2014. Retrieved December 3, 2014. ^ "Live blog: The Apple Watch". GigaOm. Retrieved March 9, 2015. ^ Clover, Juli (January 26, 2016). "Apple Watch and Apple TV See Record Quarterly Sales". MacRumors. ^ Supports up to two-channel stereo unless otherwise noted.